Found one file extension association related to BVS Solitaire Collection and 1 file format developed specifically for use with BVS Solitaire Collection. BVS Solitaire Collection is a high-class collection of 430 solitaire card games. 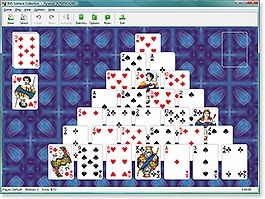 It includes all the old-time favorites like Spider Solitaire, FreeCell, Pyramid, Klondike, Scorpion, Seahaven Towers, Accordion, Russian Solitaire, Carpet, Monte Carlo, Forty Thieves, Flower Garden, German Patience, Golf, Cruel, ... It also includes over 100 original solitaire variations you won't find anywhere else. Interface is completely customizable. You can choose from lots of backgrounds and card backs, or you can use any .bmp or .jpg image files to create your own backgrounds and card backs. BVS Solitaire Collection gives you the plethora of statistical and scoring screens to track your performance and progress in playing solitaire. If you need more information please contact the developers of BVS Solitaire Collection (BVS Development Corporation), or check out their product website.